Katlyn Graham: Hello, I’m Katlyn Graham, here with Kirk Forsyth, the General Manager at Gardner Mattress. Welcome, Kirk. Kirk: Happy to be here. Katlyn: We’re discussing choosing a mattress. Let’s say, Kirk, that…Actually, I do need to get a mattress. Katlyn: So I’m starting the process. What is the most important thing for me to do, first off, when I want to get a new mattress? Kirk: Just to be able to answer a few simple questions that your salesperson will approach you with. Just trying to get a simple sense of what direction firmness wise maybe that we want to go. To start looking at if you had any other conditions, allergies, back issues. Those are all good things to give your salesperson to be able to try to initially fit you for the right product. Katlyn: So have an idea of whether I like a soft mattress or more firm. Let’s say I really like firm mattresses, what’s the next step? Kirk: We would bring you over to a section of the showroom where they’ll be a variety of firm, because firm is a somewhat relative term, so it will determine how firm is firm to you? Firm could be to me maybe vastly different. Also, we’ll also have you try the mattress in different positions, how you sleep when you go to bed. So, if you’re a side sleeper, maybe the firmest product would be too firm. Something maybe one or two steps down, we’d still consider firm, would be adequate for you for your back support and comfort, obviously. Katlyn: It sounds like there are varying levels of firm, and I’m sure soft, as well. I really need to try it out. Kirk: Yeah, I wish there was a better way. All these little body mapping things that you’ll see in some of the showrooms try to make it more of a technical decision, takes it out of your hands, but unfortunately, it’s more of trial and error. Getting you in there and seeing your reaction to fit you for the best product. Katlyn: You need to see what’s comfortable and what will get me a quality night’s sleep. Kirk: Exactly, which leads to quality of life. Katlyn: Are there any other factors that I need to consider beyond that when I’m looking at a mattress? I know you mentioned firmness, if I had any conditions. Is there anything else I should be thinking about? Kirk: Again, if there was an allergy, if you had severe back issues. We try to be able to fit you for what we would consider the best solution for any of those types of issues. We also carry a range of products. For instance, if there was a high allergy issue, maybe an allergy encasement to go with a certain type of mattress over another, if you found that mattress very comfortable. Really, this comes down to mainly comfort. I try to put that up as number 1A or 1B as far as reasons to buy a mattress over another. A lot of people talk and do research before they come to our showroom so maybe I want something with more natural materials or I want something that’s flippable or I want something that has latex or memory foam. All those can be factors. When it comes down to it, it’s really about, “When I get on this mattress, as long as it’s supportive enough for my back and my posture, am I comfortable? Am I going to be comfortable?” Because if you’re not comfortable, something that’s very supportive for, say, a bad back, you’re still not going to sleep well because you’re not comfortable. Kirk: What feels good. What will keep you in a very restful position for a long period of time so you get into that deep REM sleep. Whereas if you’re tossing and turning, you’re not getting that deep, restful night’s sleep which can lead to other factors. If you’re tired all day, you can’t be productive. Long periods of that can lead to serious conditions, even including stroke. Katlyn: Oh, definitely. Sleep is number one in importance. You mentioned different materials that come into consideration, as well. Kirk: We really use a vast variety of materials for different situations. We use 100 percent latex. We use latex as a comfort layer. Memory foam as a comfort layer. Mainly what we do, though, and what we’re focusing more of our efforts into in the future, are more natural materials. Most of our mattresses do use cotton as the main filling material. We’re using a lot more wool nowadays. We’re even looking into, again, horse hairs and different varieties of natural materials which we feel the way we manufacture them lasts longer, sleeps cooler, just an overall better experience. Katlyn: You can go for these other materials, but really, it sounds like natural is more the way to go…Green bedding is such a buzzword these days. The mattresses Gardner manufactures are really quality, natural material. Kirk: Highest quality materials we can buy. We never cut corners on any filling or cushioning material. We’re always shopping other vendors to make sure we’re getting the best materials that are available, sparing no price to get them whether it be a fabric or a type of cotton. An organic cotton, potentially. Wools. We really cut no corners and there’s no stone unturned for trying to make the best mattresses we can with the best materials that are available. Katlyn: What if a couple comes in, or if my boyfriend or whatever, what should I think about when I’m considering spouses? Kirk: As I say, if the mattress is being shared, then really having both people available to try the mattress at the same time, is a real benefit for us trying to fit a couple. There are various factors with firmness. Obviously, people have different ideas of what’s comfortable but also, various other factors, in the sense of, say a person is a light sleeper and the other one is a heavy sleeper. If the light sleeper, say somebody was getting in and out of bed, say to go to the bathroom or whatever, at night, we have other products that might cut down on the motion transfer, so the other person wouldn’t be disturbed and maybe continue to sleep, as opposed to being woken up by say, more of a bouncy bed. 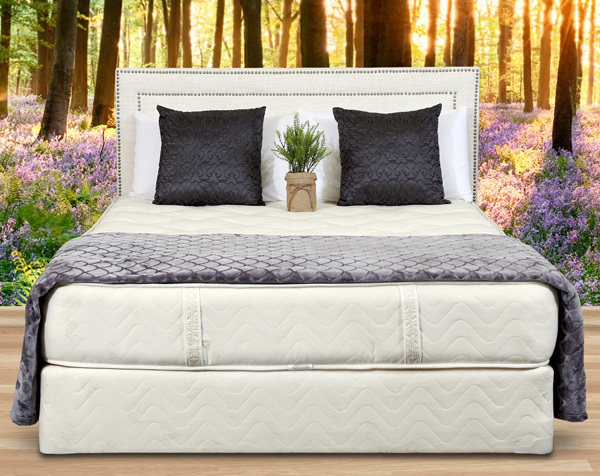 There are a lot of different factors in choosing a mattress for two people so having them both there makes a big difference to us. Katlyn: Good tip. Have both people there, for sure. There really are materials that transfer less motion, interesting. Kirk: There are. Memory form inherently is very good at that, but there is latex for a more natural version of a similar feel. Pocketed coils are very good material, a very good coil system to also cut down on motion transfer between two people. Katlyn: My last question about choosing a mattress. What about size? Is everyone coming in and saying “king size,” now these days? Kirk: No, actually. We probably sell more full sized mattresses than anywhere in the country still. No, I would say any size. In fact, that’s one of our specialties, as well, is that we can custom size anything for you, too. Say, there was an old antique bed that you had handed down or an heirloom from the family, we can manufacture to any size, shape. Obviously, mostly of what we do is twins, fulls, queens, kings, a variety of all of them. Katlyn: It sounds like it really comes down to the individual and what you need to have a quality night’s sleep. It’s not like there’s a best mattress for everyone. Kirk: You’re absolutely right. There is a mattress for everybody out there. I wish there was only one so it could make our lives a lot easier. Really streamline our production but no, we have many, many different options and we can make it as streamlined as possible for choosing the right one for you. Katlyn: Thanks for breaking that down for me, Kirk. I think I know what I want now.